When it comes to getting instant help, chat is the quickest and most efficient option. However, our customers would still depend on the phone, even if it means queuing or being put on hold with some dreadful music on. The challenge was to prompt them to use LiveChat instead of calling the support number. We’ve decided to do it using customized greetings. We found out that customized chat invites can increase your website visitors’ satisfaction and help reach your business goals faster. We evaluated the effectiveness of greetings in greater detail in a report. Sounds too good? See how we cut down on the number of phones we are getting while increasing the number of chat enquiries we handle. 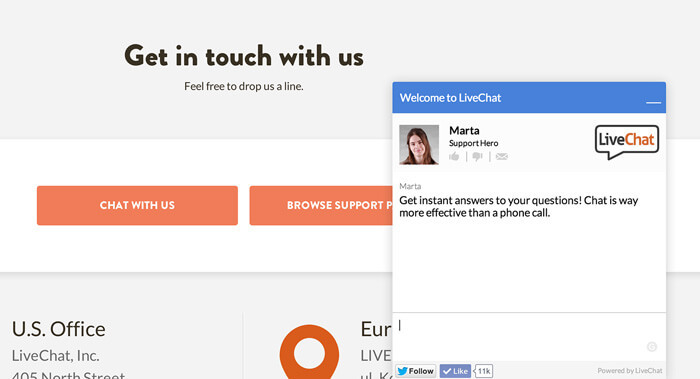 At LiveChat, we provide most of our support through chat, nonetheless, phone calls are a daily occurrence too. And we don’t mind them a bit. Quite the opposite: we value phone for its personal touch and for how great it works for sales. But, there is also a dark side to the story. Phone support doesn’t prove itself in troubleshooting and technical enquiries. Just spelling out an email address turned out to be a hassle, not to mention navigating customers through the website. Sharing links, screenshots or code snippets didn’t make things easier either. For these reasons only, a vast majority of calls ended up with customers being redirected to a chat anyways. Apart from that, there is also the efficiency factor. At LiveChat, we multitask by handling up to six concurrent chats, whereas via phone, it’s possible to help just one customer at a time, putting five more on hold. And since we used to receive about 15 calls a day, the handling times got a bit tricky. We needed to find a way to reach our customers before they could reach for their phones. We set up a simple trigger which pops up for anyone landing on the contact page in search for our number. After five seconds, each visitor receives a customized message offering on-the-spot support. The results were quick to come. In just a few days the number of phone calls has dropped by 60% to 5-6 a day, while the number of chats increased. Switching the volume from phone to chat has made things smoother for agents and customers alike. It improved communication efficiency and case-handling times. Agents could chat with multiple customers and solve their cases at the first contact and without changing channels. Where to place the greeting: Looking for the phone number, visitors would inevitably land on the contact page. Using this knowledge and real time visitor tracking, we could trigger a greeting for anyone visiting this particular URL. When to trigger the greeting: We’ve set a second trigger that would fire after a set amount of time. Five seconds seemed sufficient enough to forestall visitors from calling the support, without being intrusive at the same time. What format to choose: Once the visitors have been identified as seeking contact, they would receive an automated pop-up message offering on-the-spot support. Picking up those little details, we were able to create a personalized, user-friendly experience, which proved highly effective. By meeting the customer’s need (the need of contact), the tailored greeting has reached the conversion rate of 18%. Read our tutorial if you want to know more about using greetings on your website. Shifting the traffic has translated into 180 chats replacing about 30 phone calls monthly. Since its implementation in April, the greeting has converted 430 customers. Consequently, it’s saved us nearly 40 hours for support (assuming that an average call lasts from five minutes up) and helped reduce the number of customers put on hold. Looking at the numbers, it’s clear that reducing the frequency of calls improved our resolution times and boosted the efficiency of our team. What is less evident, but equally important, by offering an alternative means of contact, we’ve also engaged those customers who were too intimidated to call us. We handle more chats, miss fewer opportunities and solve more problems. In the end all this means happier customers and all this thanks to one tailored greeting. Justyna is a natural when it comes to customer service. She handles all customer cases with great care and dedication.